Commercial Electric uses an integrated LED light source to produce the same light as traditional incandescent light bulbs using 70% less electricity. Because the LED light source is built into the fixture, there are no bulbs to replace or recycle. This collection features a simple, elegant style with a brushed nickel finish and frosted glass shade that diffuses the light so that there are no shadows or dark spots. These ceiling flushmounts are low profile to hug the ceiling, clearing space for opening doors and making rooms feel more spacious. These ceiling lights are built with steel to look great and save you money for many years while blending nicely with the decor of your home. FIVE YEARS LIMITED WARRANTY from the original date of purchase against defects in material and workmanship. This warranty is limited up to the amount of original purchase price of the product, excluding any installation nor repair labor cost. For any inquires call 1-800-345-0542. Classic melon glass shade for a traditional contemporary look. Full coverage flushmount easily hides existing ceiling flushmount opening. Suitable for damp locations making fixture a perfect fit for bath, kitchen, and service porch areas. This 6-inch LED Globe Flushmount comes with White Frosted Glass shade, Metal Pan in Brushed Nickel finish. ENERGY STAR certified. LED will not be seen by eyes through shade. It brings with even light distribution, good replacement for current incandescent version. Idea for Kitchen, laundry, living room, basement. Easy to follow the instruction manual, good choice for your home improvement. 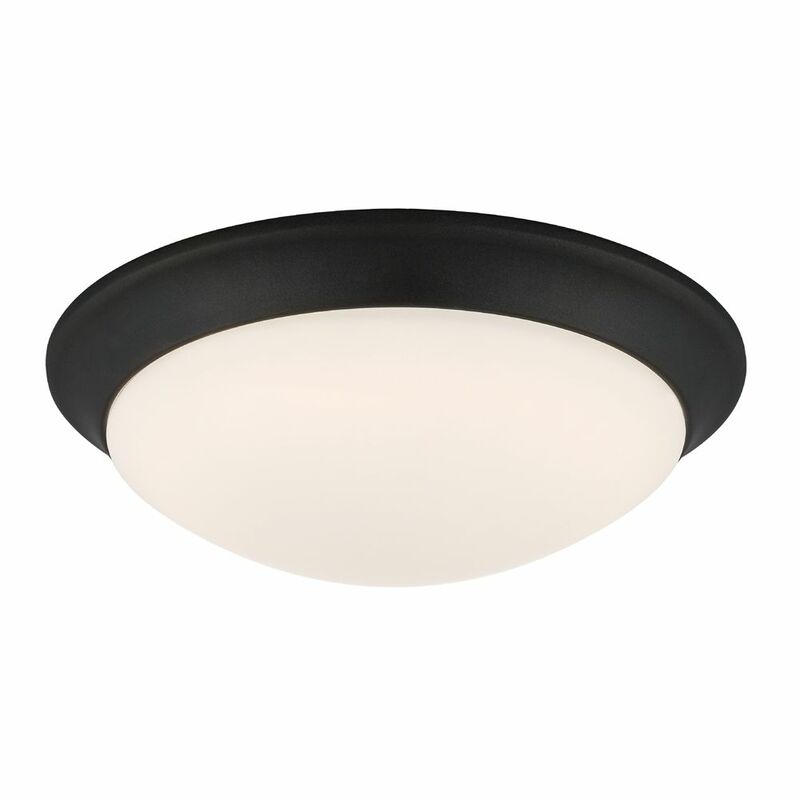 This stylish, energy efficient LED ceiling light from Home Decorators Collection is perfect for kitchens, laundry rooms, closets, bedrooms, and utility rooms. The frosted white acrylic lens distributes light evenly, while the brushed nickel trim enhances any decor. The LED engine in this ceiling light uses 80% less power to produce the same light as a 100W bulb, and there are no bulbs to replace. Home Decorators Collection Crystal LED Ceiling Flush Mount Fixture will add style & sophistication to any room in the home. The crystal accents bring sparkle to bedrooms, kitchens, hallways and even bathrooms. This energy efficient, long lasting crystal fixture is certain to bring elegance wherever its placed. The white frosted diffuser enhances the brushed stainless steel finish. The 6 LED modules provide plenty of bright light that reflect & sparkle around the crystal accents. Easy installation, and a timeless look for years to come. 11-inch 60W Integrated LED Ceiling Flushmount in Satin Bronze (2-Pack) - ENERGY STAR® Commercial Electric uses an integrated LED light source to produce the same light as traditional incandescent light bulbs using 70% less electricity. Because the LED light source is built into the fixture, there are no bulbs to replace or recycle. This collection features a simple, elegant style with a brushed nickel finish and frosted glass shade that diffuses the light so that there are no shadows or dark spots. These ceiling flushmounts are low profile to hug the ceiling, clearing space for opening doors and making rooms feel more spacious. These ceiling lights are built with steel to look great and save you money for many years while blending nicely with the decor of your home.